Creators Of Popular Trivia Game[Trivia Crack] Has Just Released A New Multiplayer Online Battle Arena Game In Google Play Store And It Sounds Good. In This Game, You Fight With Other Players From All Over The Solar System In 5 Minutes Real-Time Matches. Etersand Warriors Is Currently In Beta. [Also, See – Best Puzzle Android Games]. Become A Warrior – In This, You Learn How To Attack Other Players Or How To Move. To Attack Simply Hold And Release Towards Your Enemy. 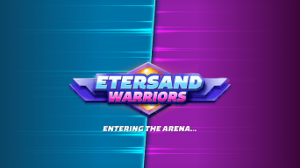 Know The Arena – You Learn About Etersand Warriors Game’s Arena. Build Your Squad – After Completing Two Tutorials, You Unlocked A New Warrior. Team Fight – This Is The Last Tutorial In Which You Fight With Bots As A Team Against Bots. Etersand Warriors Comes With Two Modes – You Play/Fight Solo Against Real Players And Play/Fight As A Team With Friends Against Other Players. What You Have To Do? – In Etersand Warriors, You Enter Into Battle Arena In Which Your Goal Is To Destroy Tower Base Of Your Opponent. Similarly, Your Opponent’s Goal Is To Destroy Your Tower Base. You Play As A Hero[Initially You Get 2 Unlocked Out Of 9]. When The Battle Starts You Can Switch Between Unlocked Heroes. Each Hero Has Some Special Skills, Abilities, Performance. Gameplay – In Limited Time, You Have To Destroy Tower Bases. Player Who Destroys More Tower Bases First Will Win The Match And Get Reward[In-Game Currency]. Each Tower Base Holds Some Region. You Have To Avoid That Region Because If You’re Inside It, Then You Will Be In Trouble. Restore Energy – If You Get Hurt Or Your Energy Is Low Then Go To There From Where You Started/Landed. Upgrade Your Hero Or Train Your Warrior To The Max Level To Win Battles. You Can Choose Graphics Quality From Settings – Low, Medium Or High. There’s A Practice Mode Also Where You Can Practice For Battles. 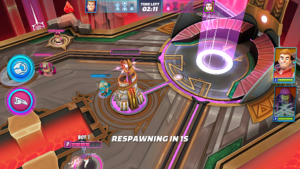 You Need To Login With Facebook Or Google Play In Order To Add Friends To Play In Team Fight Mode[2v2]. Overall Etersand Warriors Is A Great Game – No Lag, Awesome Graphics, Optimized For Low-Performance Phones, And Smooth Controls. Size – 110 MB/Varies[Approx.]. Price – Free[In-App Purchase]. Download – Here[Google Play Store].